West Indian Manatees, also known as sea cows, graze on the sea grasses that surround the Gulf Coast beaches. Adult manatees weigh up to one ton and can consume over a hundred pounds of vegetation each day. Despite their size, manatees are extremely sensitive to cold water. During the warmer months, these gentle creatures are dispersed throughout the area, equally at home in fresh or salt water. During cooler weather, they congregate around springs and water warmed by power plants. Floridians have protected manatees since 1892, when it became illegal to kill them. 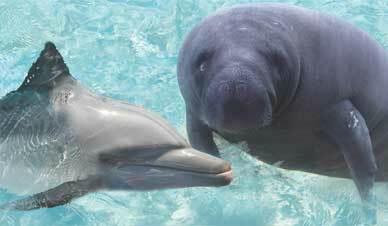 Still, the manatee has been listed as an endangered species since 1967, with over 3,000 remaining. The protection of the manatee requires your cooperation. No matter how tempting, providing food or water to a manatee is prohibited. Remember, their future is in our hands. Call the Wildlife Alert Hotline 1-888-404-FWCC (3922) or *FWC/#FWC, or use VHF Channel 16 on your marine radio if you see an injured, dead, tagged, or orphaned manatee, or if you see a manatee being harassed. 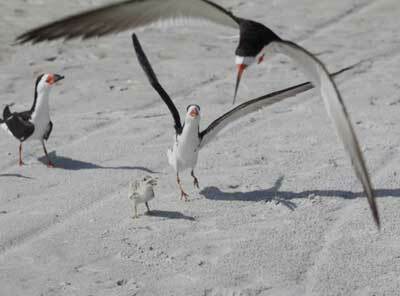 Anna Maria Island’s beach nesters include Black Skimmers, American Oystercatchers, and Snowy Plovers. There is the possibility of Wilson Plovers, Willets, and even the endangered Piping Plover nesting in the sand dunes around the island. The Island has many bird visitors feeding and loafing (a birding term for resting) along the shores. These birds include Red Knots, Sandwich Terns, Royal Terns, Forester’s Tern, Semipalmated Plovers, Rudy Turnstones, Laughing Gulls, and many more! The gopher tortoise grows on average to be about slightly less than one foot long and weighs about 29 pounds, though they have been found to be as large as 16 inches. In Florida gopher tortoises are on the Endangered Species List, categorized as a Threatened Species. Both the tortoise and its burrow are protected under state law. Gopher tortoises must be relocated before any land clearing or development takes place, and property owners must obtain permits from the FWC before capturing and relocating tortoises. Gopher tortoises are often called wildlife landlords because their burrows are essential to the lives and well-being of many other wildlife species. Over 300 species of invertebrates have been documented using tortoise burrows. Gopher tortoises are the only tortoises native to North America. They are known for their digging ability, their burrows can be 48 ft long and nearly 10 feet deep. 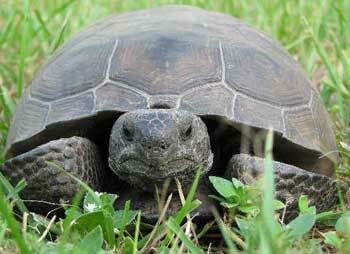 Gopher tortoises live upwards of 100 years.